IT’S long been recognised that one of the beef industry’s ‘Achilles heels’ in getting carcase performance feedback to the stakeholders that matter most – the breeders – has been in livestock sold to feedlots as feeder cattle. Whereas vendor-bred slaughter cattle sold direct to meatworks are provided with carcase feedback via slaughter floor and MSA kill sheets, a breeder selling younger stock to a feedlot typically never sees that information. That presents considerable challenges to breeders in delivering performance improvement. But that ‘black hole’ is starting to change, with one of the nation’s largest lotfeeders launching an important new feedback facility this week. Suppliers of feeder cattle to Teys Australia yards across eastern Australia can from now on receive a comprehensive package of performance information, covering average daily gain in the feedlot; plus carcase weight, MSA index, ossification, marbling, meat colour and eye muscle area from the meatworks chillers. Once DEXA starts, Lean Meat Yield will also be included in the suite of performance information, and animal health performance, in the form of offal condition and downgrades, will also be added over time. All this information will be provided on an individual animal basis, rather than on a mob basis, using NLIS as the ‘glue’. Each vendor of feeder cattle to a Teys yard can from now on request a report, once the cattle have been slaughtered. Typically this will be about three to four months after the cattle have been delivered – allowing for induction at the yard, a 70-100+ day typical grainfeeding period, and processing. Most importantly, the carcase quality, yield, feedlot performance and animal health data will also be indexed against other cattle being fed and processed out of the same feedlot, at the same time. All this presents, for the first time, an opportunity for cattle breeders selling stock as feeders to make much more informed genetic decisions and management decisions affecting the performance of those cattle in the feedyard, and in the chillers. Rangers Valley and Elders Killara are the only other substantial yards that Beef Central is aware of that goes even close to providing carcase performance and benchmarking information of this type, on bought feeders. As Beef Central’s Top 25 Lotfeeders report shows, Teys is the second largest lotfeeder in Australia, with its Condamine (Qld), Jindalee (NSW) and Charlton (VIC) feedyards having a one-time capacity of around 67,000 head, and annual turnoff of around 220,000 head of grainfed steers and heifers. Once the company installs its DEXA equipment in its beef plants (preparation for installation at the company’s Lakes Creek plant near Rockhampton is now underway, and likely to be activated by November, followed by Wagga and other sites later), the lean meat yield information on the finished carcases will also be provided. In a frank admission yesterday, Teys director of livestock, Geoff Teys, told a producer audience at Duaringa, Central Queensland that his company (and in effect, the broader processing/lotfeeding industry) had been deficient in addressing the problem of feedback to feeder cattle suppliers up to now. “It’s not an easy task, but technology around data collection and management has allowed that to change, however,” he said. “We’ve tried to do it earlier, at different yards, but one of the challenges was that results could be misleading. Results on a line of cattle at a southern feedlot, in the middle of a very wet winter period, for example, might not look very good. But by benchmarking that performance against all other cattle being fed and slaughtered out of the yard at the same time, it puts a result into some context,” he said. 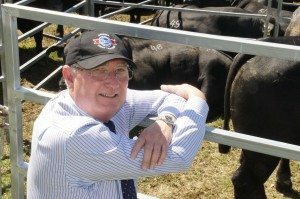 He said early results on yield calculation were showing that some cattle could achieve the ‘ideal combination’ of both superior performance for carcase quality characteristics, as well as superior performance for lean meat yield. “This should be music to the ears of seedstock producers, in being able to select for those animals which can tick both boxes,” he said. A question was asked during the Duaringa producer day (more details later this week), asking what happens when a ‘backgrounder’ business buys young weaner cattle from a breeder, before in turn selling them on to the feedlot. “There are privacy issues with such disclosure, over who owns the cattle,” Mr Teys said. The new feeder cattle performance data facility may well provide a ‘competitive advantage’ to Teys, in a competitive feeder cattle market environment, by incentivising producers through access to the data for future improvement. Teys also announced during the Duaringa producer day that it will shortly start to offer forward contracts on grainfed cattle for slaughter at the company’s Lakes Creek, Central Queensland plant. Up to now, only small percentages of the Lakes Creek kill have been grainfed cattle. Fantastic development but a long time coming! The next obvious step is to attach some transparent and meaningful premiums to the high performing cattle. Even retrospective bonuses paid after processing is worth consideration. Only then will we see breeders and backgrounders seriously pursue eating quality and yield in their breeding and buying decisions. About time!! I had to become a serial pest in order to get feed back from Teys in the past. I thought jbs and the old AMH had been doing this for the past 10+ years?